How do I Test My VirusScan Installation??? You are here: Home / Tips / How do I Test My VirusScan Installation??? After installing VirusScan, you may logically wonder, how do I know if it’s working? The answer is a test virus. The EICAR Standard AntiVirus Test File is a combined effort by anti-virus vendors throughout the world to implement one standard by which customers can verify their anti-virus installations. To test your installation, copy the following line into its own file, then save the file with the name EICAR.COM. More detailed instructions are found below. If VirusScan is running and configured correctly, when you try to save the file, VirusScan will detect the virus. If VirusScan is not running, start it and scan the directory that contains EICAR.COM. 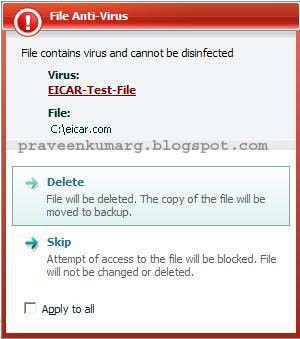 When your software scans this file, it will report finding the EICAR test file. Note that this file is NOT A VIRUS. Delete the file when you have finished testing your installation to avoid alarming unsuspecting users. 3. Click the File menu and select ‘save as’. 5. Name the file eicar.com. i cant understand this…i ve that eicar.com file and wat should i do wid it now?? how do i run it and how do i get the result of it displayed??? Harsha the Moment i created this eicar.com file,Kaspersky detected this as Virus and Deleted it. dats y i disabled my eset and created this asu assured that its not a virus.but,i did not under stand wat to do wid that file…can u plz tell me…wat next to do after creating this.